Pablo Picasso and Gertrude Stein meet again – and argue about art and life – in After Life, a new MOR-commissioned opera by Tom Cipullo. Pablo Picasso and Gertrude Stein were towering artistic figures of the 20th century and among its most influential. Stein was one of Picasso’s early advocates. He painted a portrait of her that has become widely known, and she wrote a memoir about him. They maintained an unusual friendship and exchanged correspondence from 1906 until 1944. While both were iconoclastic creators, Stein and Picasso held starkly divergent political views and responded in strikingly different ways - in their lives and their art – to the Second World War and the Nazi occupation of Europe. Music of Remembrance commissioned composer Tom Cipullo’s chamber opera, After Life, as part of the organization’s continuing commitment to remembering the Holocaust through new music that challenges audiences to re-examine conventional perspectives. In the opera, Picasso and Stein meet again in a posthumous debate filled with both passion and humor. They argue over the moral responsibilities of artists to address the evil they see in the world. They confront each others’ weaknesses, and their own, in succumbing to vanity and ego. American composer Tom Cipullo has been drawn before to artistic themes that pose difficult moral questions. His highly-regarded 2006 opera, Glory Denied, tells the story of America’s longest-held Vietnam prisoner of war Jim Thompson. Allan Kozinn wrote in the New York Times: "How is this for a story with operatic potential? A prisoner of war held for nearly a decade returns home to find that his wife has moved on, his nation has changed beyond recognition, and he is unable to find his bearings in the society he fought to defend. It is Monteverdi's ‘Ritorno d'Ulisse in Patria’ in reverse: the story of the returning warrior, but in this thoroughly modern version, everything has gone wrong, and redemption is out of reach.” Anne Midgette, in the New York Times, described the work’s lyrical richness: "It is tonal, melting into aching lushness…propelled by driving Bernstein-like syncopations where different versions of the same truth converge." The world premiere featured guest artists mezzo-soprano Catherine Cook (San Francisco Opera), soprano Ava Pine (Fort Worth Opera) and baritone Robert Orth, who has been hailed by Opera News as “fixture of contemporary opera." 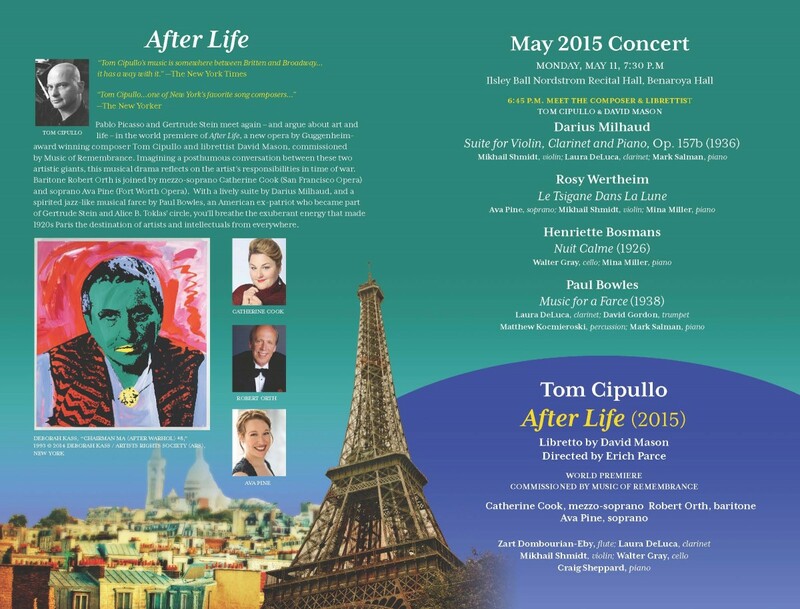 Click here to view information about After Life in our season brochure! Darius Milhaud belonged to “Les Six,” the name coined in 1920 by French critic Henri Collet for six composers who worked in Paris’ Montparnasse quarter. According to Milhaud, Collet chose the six names “. . . absolutely arbitrarily, those of [Georges] Auric, [Louis] Durey, [Arthur] Honegger, [Francis] Poulenc, [Germaine] Tailleferre and me simply because we knew one another other and we were pals and appeared on the same musical programmes, no matter if our temperaments and personalities weren't at all the same. Auric and Poulenc followed ideas of Cocteau, Honegger followed German Romanticism, and myself, Mediterranean lyricism!” If the six didn’t share a common musical style, they helped define the heady avant-garde artistic milieu of Paris in the 1920s. With Jean Cocteau and other writers and artists, they frequented a cabaret-bar called “La Gaya.” When the establishment moved to larger quarters on rue Boissy d'Anglas in the 8th arrondissement, it was renamed for Milhaud’s surrealistic ballet “Le boeuf sur le toit” (The Bull on the Roof). The opening party included Pablo Picasso, Maurice Chevalier and Serge Diaghalev. Milhaud was prolific as a composer, with over 400 works that included operas, symphonies, concertos, chamber works, ballet music and film scores. From his earliest years, he was drawn to folk and popular styles. During two years as secretary to Paul Claudel, the poet and playwright who was then the French ambassador to Brazil, Milhaud became fascinated by Brazilian tunes and rhythms that inspired “Le boeuf sur le toit.” Not long after, Milhaud traveled to New York and was deeply influenced by the jazz he heard in the streets of Harlem. The following year, he composed the jazz-infused ballet “La création du monde” (The Creation of the World). Milhaud’s 1936 Suite for Violin, Clarinet and Piano is drawn from the composer’s incidental music for Jean Anouilh’s play “Le voyageur sans baggage” (The Traveler without Luggage). The play is an ironic critique of identity and class, and Milhaud’s sprightly music captures the play’s existential absurdity. The clouds of World War II were forming, though, when Milhaud wrote this music. Born to a Jewish family in Marseilles, he was forced to leave France in 1940. In the United States he secured a teaching position at Mills College in Oakland, California, where Dave Brubeck was one of his leading students. After France’s liberation, Milhaud returned to teach at the Paris Conservatoire, but still taught and conducted in America often until failing health forced him to retire in the early 1970s. The names of Rosy Wertheim and Henriette Bosmans are little known outside the Netherlands, but the two women composers played an important part in the country’s music life between the world wars. Wertheim was born in Amsterdam to affluent Jewish parents who sent her to a French boarding school in Neuilly, outside Paris, where she took piano lessons and displayed formidable musical talent. Growing up she was drawn to a career in social work, but her piano teacher convinced her to pursue a life in music. Still, Wertheim never lost her passion for social causes or her concern for working people. In Amsterdam in the 1920s, she conducted the Jewish women’s chorus of the Religious Socialist Society, taught piano to poor children, supported needy families out of her own pocket, and led a children’s chorus in a low-income neighborhood. In 1929 Wertheim moved to Paris, where her home was frequented by Dutch artists and musicians, and by some of the day’s most important French composers: Milhaud, Messaien, Jolivet and Ibert. She left in 1935 for Vienna, and in 1936 and 1937 spent time in the United States. While abroad she had a number of her compositions performed, and also worked as a foreign correspondent for Dutch newspapers. Wertheim returned to Amsterdam in 1937 to a difficult situation that soon became much worse. After the Netherlands was occupied by Nazi Germany in 1940, Wertheim gave covert concerts in her basement, often including works by Jewish composers whose music had been banned. In 1942 she went into hiding in order to escape deportation. Wertheim survived the war, but died of an illness in 1947. Wertheim composed over ninety works, among them a highly successful piano concerto, a divertimento for chamber orchestra, numerous chamber pieces for small ensembles, and songs. Her early compositions, especially, were influenced by French Impressionism. The 1916 “Le tsigane dans la lune” (The Gypsy on the Moon) that we hear tonight is based on a poem by the late 19th-Century symbolist poet Henri Cazalis. Henriette Bosmans grew up surrounded by an elite circle of Amsterdam’s musical world. Her father, who died when she was an infant, had been principal cellist in the Concertgebouw Orchestra, and her mother taught piano at the Amsterdam Conservatory. Visitors to her childhood home included the likes of Joseph Joachim, for whom Brahms wrote his violin concerto. Studying piano with her mother, Bosmans became a young star and performed with the Concertgebouw under Willem Mengelberg and Pierre Monteux while still in her teens. Bosmans’ early efforts at composition are reminiscent of German Romanticism, but her musical language became strikingly more modern after she began studying with the Dutch composer Willem Pijper in the late 1920s. Like Wertheim, she was forced to abandon public musical life during the Nazi occupation, and her music was banned. Still, she played as a pianist at secret house concerts. Bosmans died of cancer in 1952. Bosmans’ lushly langorous “Nuit Calme” (Calm Night) is the second in a set of three “Reflections” (along with “Cortège” and “En Espagne”) for cello with piano accompaniment. The instrument’s prominence in Bosman’s early works probably grew from her relationship with the cellist Frieda Belinfante, with whom she lived and shared a bohemian life at that time. In 1921, Bosmans wrote a piano trio, and two years later Belinfante performed the premiere of Bosmans’ second cello concerto. No account of the exuberantly fertile expatriate community of artists and musicians in Paris between the world wars would be complete without the name of American-born composer and writer Paul Bowles. Bowles first traveled to Europe when he was 19, after one of his poems had been accepted in the Parisian literary review “transitions” that was a forum for such important modernists as James Joyce and Paul Élouard. Back in New York, he began studying composition with Aaron Copland. When Copland announced his plan to return to Europe, Bowles eagerly followed and also studied in Paris with Roger Sessions and Virgil Thompson. Bowles quickly immersed himself in Paris’ intoxicating avant-garde scene, including the rue de Fleurus salon of Gertrude Stein and Alice Toklas. Stein’s advice about his poetry and music was often painful, but she was an important formative influence. It was at Stein’s urging that Bowles first traveled (with Copland) to Morocco, where he later spent the final decades of his life. Bowles wrote operas, ballet music, and chamber and orchestral works. He also composed extensively for theater and film, including music for plays by Tennessee Williams, Lillian Hellmann, Oscar Wilde, Albert Camus, Sophocles, Euripides and Shakespeare. In 1938 Bowles was living in Èze-Village, on the Côte d’Azur, when he was approached to write music for the film sequences in a New York production by Orson Welles of a farce called “Too Much Johnson.” Needing the money, and intrigued by a collaboration with Welles, Bowles sailed to New York and moved into a $15-a-week room in the Hotel Chelsea to work on the project. Bowles completed his score within a month and brought it to Welles, only to learn that Welles had cancelled “Too Much Johnson” and decided to produce a tragedy instead. For his trouble, Bowles was offered $100. To salvage the music, Bowles made a few cuts and called the “new” piece “Music for a Farce.” Its premiere several months later at a League of Composers concert in New York received rave reviews. Bowles died of heart failure in Tangier in 1999, after a bold peripatetic life engaged with the forces and people around the world that shaped his times. Because Bowles mirrors the popular imagination of flamboyant expatriate life in Europe, people have often wondered about his connection to the Sally Bowles character in the “Cabaret” musical play and film. Sally’s character was fictional, but Christopher Isherwood was thinking of Paul Bowles when he chose her name for the stories that became the basis for “Cabaret.” Others know of Bowles though the Bernardo Bertolucci film “The Sheltering Sky,” set in Morocco and based the novel that Bowles wrote there. We’re accustomed to thinking of great artists – in music, literature, painting and other forms – as those whose works endure because they resonate beyond the time, place and circumstances of their creation. Still, those artists are products of their own times, and their works reflections of how they understood and responded to the world around them. In many ways, the lives of Pablo Picasso and Gertrude Stein shared a similar arc, and their histories are intertwined. Stein, the American, and Picasso, the Spaniard, both gravitated to Paris at the start of the 20th Century. Both were brash modernists who exerted an outsized influence on their contemporaries. Stein was an early champion of Picasso’s work. He painted a well-known portrait of her, and she later wrote a poetic depiction of him. The two maintained a complicated friendship for decades, despite strong disagreements over politics. With the spread of Fascism and then Nazism in Europe, Picasso and Stein reacted in very different ways. In one of the most powerful anti-war paintings ever, Picasso’s “Guernica” depicted the savagery of that village’s bombing by German airplanes in support of Franco’s Nationalist forces in the Spanish Civil War. Stein, on the other hand, publicly endorsed Franco, and she was an admirer and translator of Philippe Pétain, the leader of France’s collaborationist Vichy government. Stein held many views that today would be considered conservative, even reactionary and perhaps elitist; Picasso joined the Communist Party in 1944 and remained an ardent member. In 2011, the San Francisco Museum of Modern Art mounted the exhibit “The Steins Collect,” a fascinating examination of that family’s relationship to Picasso, Matisse and other painters of the Parisian avant-garde. Only steps away, the San Francisco Contemporary Jewish Museum showed “Seeing Gertrude Stein: Five Stories,” exploring her private life, her artistic relationships, her public mystique, her politics, and her life in France during the war. Viewing the two exhibits side-by-side suggested an intriguing question that led to MOR’s commissioning of After Life: How would Stein and Picasso have continued their conversation? (Stein died in 1946, only a year after the end of the war; Picasso lived until 1973.) Would either of them look back and reconsider their artistic or political ideas? How would they react to the ways in which the world had come to see them and their work? Would either of them look back to recognize their own ego and vanity? (And would they contend that arrogance was integral to their genius?) Would they argue that artists are bound to respond directly through their works to the evil they see? Or is the very act of creating a form of resistance in itself? In their new opera, composer Tom Cipullo and librettist David Mason have created a masterful musical drama that challenges us to consider these questions through the ghosts of two giants as they reveal both their brilliance and their human flaws. About Music notes by David Sabritt. Copyright 2015 Music of Remembrance. The composing of After Life presented a number of challenges. David has called his elegant libretto a tragicomedy, and the delicate balance of these two sides was prominent in my mind as I worked. I allowed myself a bit of fun in incorporating quotes from Menotti’s The Medium when Gertrude Stein attempts to conjure Alice Toklas. In creating music for the fascinating, larger-than-life characters, I tried to capture Stein’s outsize ego and Picasso’s virility. Surprisingly, the character of the young orphan girl presented the greatest range of emotions. In her barely fifteen minutes on stage, she demonstrates calm, patience, sorrow, rage, resignation, wisdom, and grace. The composer would like to express his deep appreciation to Music of Remembrance and Mina Miller for commissioning After Life, and to James and Sherry Raisbeck for the generous support that made the work possible. Thanks also to David Mason for crafting a libretto that is both eloquent and inspiring. After Life is dedicated to my colleague and dear friend, the brilliant composer Lori Laitman, and also to the memory of Lori’s mother, Mrs. Josephine Propp Laitman. Music of Remembrance is always seeking new ways of remembering, new stories to tell, and when it was suggested to me that the wartime experience of Pablo Picasso and Gertrude Stein might provide good material, I began my research. Almost immediately I realized that these two estranged friends, two major artists of the twentieth century and, arguably, two outsized egomaniacs, would provide me a great opportunity to explore the culpability of artists in Vichy and occupied France. What is the position of art in a time of war? How does art respond to political and military disaster? And what can artists possibly do in the face of such massive evils as Nazism and the Holocaust? Both Picasso and Stein remain controversial in terms of how they survived the war. Stein was a Jew, though not practicing, and she seems to have been naive about the oncoming invasion, denying its reality and impact until it was too late for her to do much about it. Critics of Stein have wondered about her decision and her friendships with several collaborationists. How was it that she, as a Jew, was spared? Was she aware of other Jews in her area who were taken away—including children from a nearby orphanage? Though Picasso was not a Jew, he had Jewish friends in Paris, where he spent much of the war. Some have accused him of collaborationist tactics in order to preserve himself; others have claimed he was active with the resistance, or at least in sympathy with it. He certainly felt very strongly that his art was a form of resistance, and endured frequent Gestapo inspections of his studio and his paintings kept in a bank vault. This is a story about artists in relation to history—the darkest history imaginable. My first brainstorm was in the title, "After Life." The script would be set in an amorphous after life, long after both artists were dead. But artists are always after life—they want to seize it, to possess it, and that is at the root of their art. They also come after life in another sense, modeling their work on experience of various kinds. I realized that Stein would be conjuring Picasso, her estranged friend, because he had died more recently than she and might know more about how they were both perceived in posterity. She conjures him because she has something urgent she must ask him—what has become of them, now that they are dead? The libretto begins with absurdist comedy as these two artists confront each other in this other realm. Stein felt she had in a sense invented Picasso, and Picasso resented her for it. The introduction of a third character, an orphan girl who as a teenager had met Stein and Toklas, turns the libretto toward tragedy. The girl, taken to a concentration camp from her French orphanage, knows her anonymous death is recorded and remembered by no one. She knows the reality of death in a way neither of these artists, bent as they are on immortality, has quite comprehended. It is she who must teach them what death is, so they can finish dying as human beings.